Jordan Brand has been known to produce one of the best basketball shoes in the market, but the famous shoe line will revolutionize the sneaker market once again this month with the release of the new version of Jordan Flipsyde shoes. 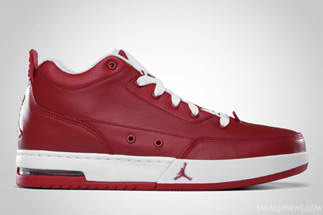 Jordan Flipsyde is not your typical basketball shoes, it as Skate shoe for you skaters out there. Although it’s a skate shoe, it can also be worn for everyday and sporting uses. Two years ago, Jordan Brand released three colourways of the shoes, and this month the much-improved White-Varsity Red color is expected to be a hit in the market this month especially during the holiday season. Like its predecessors, it features a thick sole and outsole with padded tongue, making it very durable so you should not dare miss the Jordan Flipsyde this month.